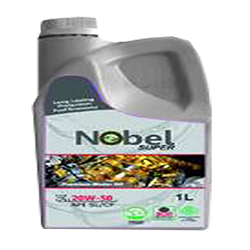 Nobel Superplus 20W-50 is a premium quality, semi-synthetic, ashless-dispersant engine oil. It is formulated from select, highly refined mineral base oil and ashless performance additives providing outstanding engine cleanliness, wear protection and corrosion protection. Nobel Superplus 20W-50 provides greater reliability for your engine. Nobel Superplus is particularly suited for turbocharged engines. Perfectly adapted to vehicles equipped with catalysts and using unleaded fuel or Liquefied petroleum gas, LPG. It can also be used in all operating conditions (city traffic, road and motor ways), whatever the season.